On a stop over earlier this year en route from Sydney to Berlin, I was once again reminded of the chaos that is Bangkok. I was relieved to read that the horrible recent floods in Bangkok are subsiding and life is slowly returning back to normal. I was recently thumbing through my tatty Moleskines full of notes and such from my 2011 travels. While Ziva is not a pure travel blog, I figured nonetheless that now was as good a time as any to bring my scribbled, muddled thoughts into some kind of coherent order and share them before the year’s end. _______________________________________________ A young teenage couple sat next to me, both wearing what was supposed be the school uniform of a preppy,international school but with a few,unauthorised after-school-additions: She had black high heeled leather shoes and sleek, GHD-ed hair. He wore a basketball cap, carelessly draped over his sheikh turban. His scuffed white Cons hit the floor while he whispered sweet nothings into her ear while she was oblivious, texting on her hello Kitty iPhone. On the other table next to me, was an old man, alone, his hands mottled with veins, his face showing the lines of his life, walking stick resting on the chair while furiously eating his pad thai. This scene could be anywhere. Yet it played out in a Bangkok shopping mall. Extreme tranquility and unpredictable chaos are symbiotic in Bangkok: one cannot exist without the other. In fact they feed off each other. The urban cacophany of tuktuks, motor bikes and cars have it out with the street vendors who concoct huge tureens of bubbling street food at every street corner. And every phlemmy hock of spit on the footpath requires a game of hope skotch to dodge.It is an incredible contrast to the calmness that was to be found in Thai temples and in the sanctum of my inner city hotel. While a saffron – robed monk can whisk past you at one moment, be prepared to get run over at the next. Slipping in and out of these two worlds is possible as I discovered. And I do not mean by making an offering at a temple or getting a massage at a day spa. I mean just hanging out at shopping malls. Photo pacoalfonso. Literally. Spending a good few afternoons in a medley of different malls, I was not intending to do a sociological field trip yet could not help but notice how shopping and malls (at least in Bangkok) are a different breed of social past time. Bangkok_malls_piece Photo guhru. But what goes in malls is a microcosm of life outside, as any sociologist will tell you. I thought back to my French philosophy classes where we read the works of the leading intellectual of his day, Pierre Bourdieu. He did say that malls are representative as a space or ‘habitus’ for a certain social class. His theories do not simply analyse society in terms of economic classes and ideologies. Much of his work revolved around the role of educational and cultural factors. He applied this to many different fields – popular culture, music, sport. Anyways, in his 1984 work Distinction: A Social Critique of the Judgment of Taste (in French, La Distinction) Bourdieu claims that how one chooses to present one’s social space to the world—one’s aesthetic dispositions—depicts one’s status and distances oneself from lower groups. Yet the sheer mixture of people who spend time in these malls- anyone ranging from the the Khao – San road scroungy backpacker to the president’s children and their troupe – seems to blur the lines between all these different social classes. So much so, that one’s ‘class’ and level of education becomes mostly irrelevant.Maybe Bourdieu never made it to a Bangkok mall when researching his works. Most Bangkok locals view malls as a totally legitimate cultural and social experience – it makes it more than just a place where you get stuck in a time vortex: there is often a purpose in going there. Malls are Bangkok’s antidote to its own craziness: airconditioned, sanctioned calm in an otherwise chaotic, sticky urban jungle. Electronics, gadgets, food, fashion,cosmetic surgery, assisted reproduction, anti-aging services: there is a mall corresponding to practically every single categorisable need or desire in life. You can purchase unpronounceable, spiky tropical fruits or set up an appointment with a ‘Free Radical Removal Doctor’ or just perch and people watch. Lipobangkokpic Many a family I spotted spending quality time together often with three generations, grandparents, parents and kids in tow. This is in stark contrast to the sad suburban malls in Sydney where a mother with a few wailing kids can calm them down with a Happy Meal at Macdonalds is her version of having a peaceful moment. Many people say that much of Bangkok’s charm lies in its quiet sois where sampling its street food served by cheeky, smiling people makes for an authentic experience. I wholeheartedly agree. But spending some time in a mall is also part and parcel of the Bangkok experience. If for nothing else, than just to get a dose of zen in the most unlikely of places. In what kind of other spots have you done the occasional sociological field trip? Sometimes you have no idea where life will take you. Back in 2010 I was in Munich, having been invited to attend the DLDwomenconference with global media, NGO and business leaders. I met two cool brothers from Denmark who told me about their charity and their journey in creating it. Their experience really struck a chord with me, given my international human rights law background and my own work with charities. So we stayed in touch. Fast forward to 2011. I was troubled by what I was reading and seeing in Africa with the famine, the growing number of refugees in world’s largest refugee camp in Kenya and the consequences of the Arab Spring on the region. When I had the idea to start this series, I realised then who was the perfect Global Faces story for the launch. As co-founder of award winning Danish charity, Refugees United, David and his brother Chris Mikkelsen have established a free, anonymous, mobile ‘tracing’ service to help refugees around the world reunite with their lovedones whom they lost touch with through displacement caused by war, persecution or natural disasters. They were inspired to set up their organisation after they met Mansour, a young Afghan refugee who had lost his family during their escape from Kabul, in Copenhagen in 2005. They established Refugees United a year later. Since then, they have gone on to partner with Ericsson amongst other mobile providers in rolling out their service, and were recognised for their cutting edge work at the Clinton Foundation in 2010. After submitting their first documentary film for a leading European digital media competition, there is no rest for the great Danes – they are about to head to Maine, USA for the annual PopTech! conference as Social Innovation Fellows. Here’s what Dave and I chatted about one Summer afternoon in late July. He was in Jutland, I was in Berlin. Petra Zlatevska: There are now some 44 million refugees in the world, the highest number in over 15 years, according to UNHCR. How is Refugees United assisting refugees who may have lost loved ones? David Mikkelsen: We have started to see more and more people using our tracing service, we’re getting around 4 000- 5 000 new sign ups to the website each month. The platform is moving towards being more web-oriented and we have 50 000 registered profiles. We still have on the ground registrations taking place through third parties. In East Africa, mobile phones are the most common form of technology. Before mobiles, many people had not even seen ‘normal’ phones, since there is an issue with cables, most people go online with their mobile phone. Outside of the cities, it is more of a challenge, as the infrastructure is even less developed there. Our web apps are designed for 2G phones, not smart phones. That means WAP- enabled phones, (old school online mobile phone which you would have seen in Europe, Australia and the US about 3 – 4 years ago). They work slower but have simpler pages. For example for our African users, when they type in m.refunite.org on their mobile phone, they will come to a simpler version of our web page. From there they access the platform. It works because it is simple to use whether from the web or a mobile phone. RU recently released a documentary film ‘Lost and Found – the Journey of Refugees United’ which features some success stories of refugees who used the service. What was the inspiration for the film? We approached Mediastorm (the production company) for this project. A few years ago, they had actually contacted us about a few ideas and we stayed in touch. When we had the idea for the film, we knew we wanted them to be involved, as they have a great reputation for making movies about topical issues. We didn’t want anything gloomy or corporate, we wanted to keep the organisation as the focus. So one cameraman followed us around in Uganda, we recorded the interviews in the studio then Mediastorm did the post-production and editing work in New York. We are really happy with the message of the film, it has kept an eye on the ball, it followed a few of the people who we are helping and their journey. We have had a recent success story: one of the women in the movie who relocated her sister in Uganda, happens to have two brothers in Denmark and the two brothers recently went back to Somalia to meet with the lost sister. We recently were asked to submit the film for the European Webbys, known as The Lovie Awards.. We are planning an official launch of the documentary in October and to enter it into the appropriate festivals. We just haven’t had time to do an official launch, so we have shared it with friends on social media, sent it to our sponsors and collaborators. The feedback has been overwhelming, viewers from different backgrounds and cultures have been moved by a film that is, by its nature, actually about a very specific group of people, refugees. Yet because the location of the film is not emphasised, and at its heart it is about people finding their loved ones, it then takes on a universal appeal. It could have taken place anywhere, whether in Zimbabwe or Iraq. The issues are taking place right now and the goal of the film is to show this. Click on the link to watch the documentary. Which nationality represents the biggest profile group? Somalians are by far are the greatest number. Our data tells us there are over 17 000 people registered on the platform indicating their nationality is Somalian. Then Congolese (from the Democratic Republic of Congo), then Sudanaese. Kenya is home to the world’s largest refugee camp, Dadaab, with more than 300 000 inhabitants, many of whom are actually Somalians who cross over, around 2000 per day by current estimates. Kenya is also home to our largest operations. RU is a pioneer in terms of using the most advanced technology to carry out critical humanitarian work. What has been the feedback from users of the web and mobile apps? Getting feedback directly from the users is hard, but we get feedback from third parties on the ground, such as NGOs and they tell us what the users need. The key problem is with the availability of data, we need this before we can analyse it and there is not much data presently available. We know we have around 40 000 profiles registered on the platform which is not a huge amount for the data community but for people who are finding their loved ones, it is significant. Last month, we launched a collaboration with the Kenyan Red Cross. We both are in the business of helping people to find loved ones, just that we use modern technology and they use more traditional, old school methods. They help and reach people in ways in which we cannot, so we complement each other’s work. Refugees United staff assisting refugees in Uganda register their details on the mobile platform. What is your next project? Is the SMS service undergoing improvements or do you have new initiatives or complementary ideas that you are developing? We do have some new initiatives in the future, yet family tracing is our current priority. We have just launched a collaboration with Safari.com in Kenya, this has an 80% share of the Kenyan mobile phone market. We also ran a successful pilot with MTN (Africa’s biggest mobile phone provider with a presence in 23 countries) in Uganda in 2010, now we have a global partnership with them. In the coming year, we aim to be active in 5 countries with MTN. We envision that they will assist us in rolling out new apps, whether for smart phones or enhancing the WAP – enabled series or assist us with outreach to refugees and as a go between with third parties. Other future possibilities are that African users may purchase a new mobile phone and there’s a pre-installed Refugees United WAP app on their mobile, or maybe there could be MTN commercials promoting the Refugees United services. 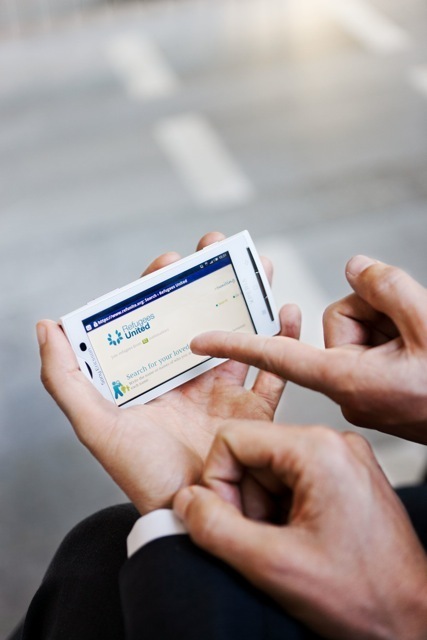 A hand held mobile phone with the Refugees United tracing service tool – users are anonymous and the service is free. What advice would you give to prospective social entrepreneurs to make their vision a reality? Make sure your idea is strong enough to get through good times and bad. I think if you are a social entrepreneur or entrepreneur generally, it’s not about having “what it takes” but if you want to pull it off, you have to dedicate a few years of your life focusing on that one thing. I’ve spent the better part of the last five years of my life together with my brother on Refugees United – it is all consuming. I’ve been luckier than most because I have had my brother by my side, I would not have done it without him. Chris (L) and David (R) Mikkelsen, Founders of Refugees United. We were non – experienced in professional terms. Before founding RU, I was into making documentary movies and had some ideas I wanted to develop, yet I wasn’t able to go all the way with that. I was involved with one start up company which went bankrupt then another which I did not buy into early enough. If I were 20 years older and had built up a few businesses or ventures, then maybe things would have been easier. We made a lot of rookie mistakes along the way. If you start a social enterprise, no matter what- look at it as something that went well, you’ll learn a lot. It’s the best school I ever attended. Other venture capitalists and social entrepreneurs say “Make sure you fail miserably: If you haven’t failed at least three times, then you won’t make it”. If you fail though, you have to make sure it doesn’t kill you financially. You cannot win every time, you do lose sometimes. When we started Refugees United, we knew there is no Plan B, there was no way we could fail. It wasn’t about making a hot record or filming a cool movie, but about people who were desperate to find their families. That gave us the drive and perspective to see it through. So many key people have been equally involved with us from the beginning – bakers who gave us free coffee, journalists who write quality, well – researched articles featuring refugees and our foundation and of course our donors. All these people have different backgrounds and life experiences but they all related to the cause and wanted to be part of it. The other thing we realised was that as humans, we do have hope for a better future, despite all the fear-mongering. We have seen that the world can be a better place, there are people with huge hearts and big brains who can make a difference. Mansour (R) who David and Chris helped reunite with his brother Ali (L) after they were both separated for six years. Refugees United has Mads Mikkelsen as its Ambassador. UNHCR has Angelina Jolie. What contribution do you believe celebrities can make to raising awareness of humanitarian crises? Any celebrity who takes on a charitable cause, is not going to be your average joe. Mads could have backed any charity on the planet, there are so many worthy projects out there. He has been there from the very beginning, I have such a deep respect for him, he takes his role as ambassador seriously. Likewise, Ms Jolie with her big family and superstar status, spends a few days out of each month on the road, fighting for refugees. Or look at George Clooney and his “Not on our Watch” he founded with Matt Damon, Brad Pitt and a few others and the work they are doing for Sudan. They are not in it for the PR, they have plenty of PR, they have had it their whole professional life. They don’t just start and then stop after three months, they are in it for the long haul. Having said that, you need to be selective about who you want to be the face of your campaign or charity. There are many famous people who we knew would definitely not suit our foundation, especially reality TV stars, they are famous for nothing. I just don’t get it. David and Chris with actor Mads Mikkelsen. What is your favourite travel destination and why? I like to travel where my loved ones are. At the moment I am in Jutland with my family and then I’ll be travelling later in the month to southern France to spend time with my niece.